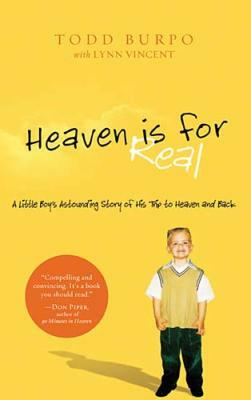 I read Heaven is for Real by Todd Burpo with Lynn Vincent in an afternoon and hope you will do the same. This beautiful story is written by the Nebraska father of a very seriously ill four-year old son who went to Heaven for a brief time during emergency surgery and returned with stories of what it was like there. With many beautiful references to the Bible and Our Lord, this book will touch your heart. I know I was deeply moved and the story brought tears to my eyes more than once. Seeing Heaven and Jesus through the eyes of a child was deeply gratifying. I will treasure and hold the message of this book in my heart for a long, long time. This entry was posted in Uncategorized and tagged Akiane Kramarik, Books, Colton Burpo, faith, Heaven, Heaven is for Real, Jesus, Lynn Vincent, near death experience, religion, Todd Burpo. Bookmark the permalink.